If you ever watch the older Dr. Who episodes with Tom Baker, you will probably remember him asking people if they want a “Jelly Baby”, which he carried around in his pockets. When I was at the grocery store I saw this bag of Tavener’s Jelly Babies and had to buy a bag so I could finally try them, I’ve always been curious about them since watching Dr. Who. 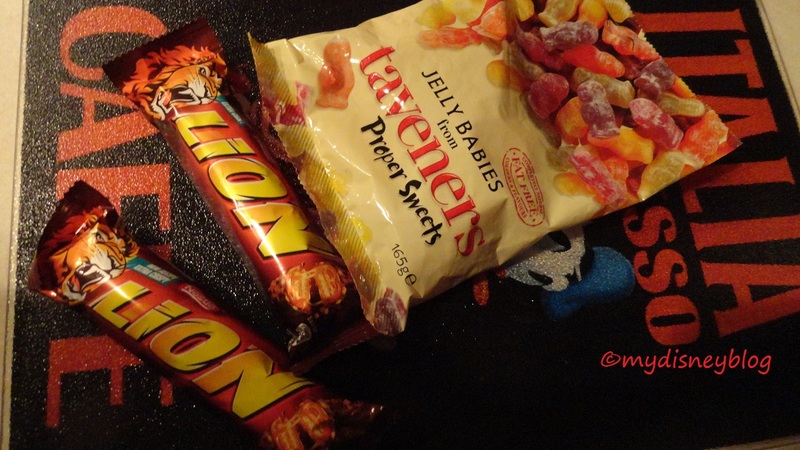 Also, I’ve seen Lion Bars in a comedy sketch on That Mitchell and Webb Look, so I grabbed a couple of those as well. They also have Nestle Lion bars at Epcot in the UK pavilion, but I can’t see paying somewhere in the $3 range per candy bar. Publix had them for about $1.50 each. So, we tried these candies and I have to say the Lion bars are a real winner, can’t go wrong with chocolate, rice krispies, caramel, and cookie; kinda like a Twix and a Nestle crunch had a baby. Definitely would buy them again. The Jelly Babies were a little strange, they were gummy-like, opaque, with a thicker sugar coating almost grainy, reminded me of a harder drier Chuckles type candy. There are different flavors in the bag, I couldn’t get used to the consistency. They are also really sweet, just two or three is enough. I am a fan of regular Haribo Gummis, but these were different and unique from anything I’ve tried before. But, still glad I got to try them!